Abuela's Weave is a picture book and a beautiful story about a Guatemalan girl and her grandmother who create a bond by working tediously to weave tapestry, skirts and tablecloths "from the heart". Despite her Abuela's appearance and birthmark that makes them both feel nervous and ashamed, their hard work pays off when they sell all of their elaborate makings. 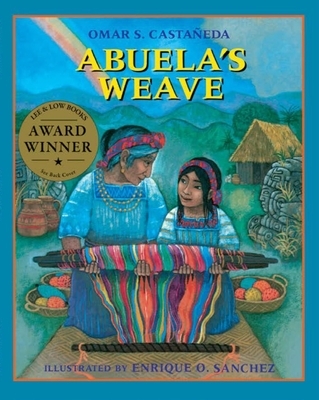 ﻿Abuela's Weave tells a story about a Guatemalan girl named Esperanza and her Abuela. Esperanza and her Abuela are nervous and lack confidence that they will sell their weavings because of Abuela's birthmark--something she has been teased about in the past. Throughout the story, Esperanza learns about her culture through her grandmother. Worked into the tapestry they make are intricate symbols and images of their country's history, and the focus of this story is identity and family tradition. When people at Fiesta de Pueblos show interest in their work, Abuela embraces her differences and shows pride in her accomplishments. This story is a wonderful portrayal of Element #1 of Self-Love and Knowledge because as Esperanza learns about her culture, her grandmother accepts herself and shows her face, an aspect that truly makes her beautiful. Abuela's Weave is geared towards grades 3-4. In my classroom, I would use this book to teach about culture, traditions and acceptance as these elements are all important for a child to understand. I would have my students discuss their own culture such as the holidays they celebrate and the traditions they have with one another. By doing this, they can learn something not only about their classmates but about how everyone is different yet we all have the same morals and similar beliefs. They will learn to respect and understand other cultures and traditions at an early age. Learning about tradition and family history of not only one culture truly fulfills any curiosity and interest a student may have about themselves, or those of another culture. Everyone and every family is different and that is important for students to be aware of due to all the ethnic and social barriers and stereotypes society has placed on this generation.